The Philadelphia Eagles were winless at 0-7 and, going back to the previous year, were struggling with an 11-game losing streak as they hosted the Miami Dolphins on November 8, 1970. 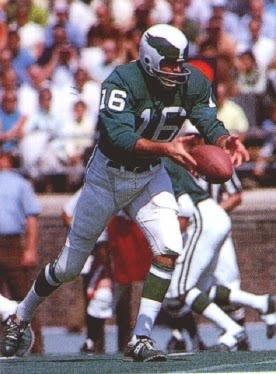 QB Norm Snead, in his seventh season with the team, had a strong arm but was immobile and interception-prone. There were good receivers, most notably WR Harold Jackson (pictured at right), but the running game missed FB Tom Woodeshick, who had gone down for the year with an ankle injury. The defense had some talent, especially at linebacker and in the backfield, but the pass rush had not been impressive thus far. Head Coach Jerry Williams made some lineup changes coming into the game, inserting rookie first draft choice Steve Zabel at tight end and moving Gary Ballman from tight end to flanker, thus benching Ben Hawkins, in the hope of improving blocking for the running game. Miami was in its first season under Head Coach Don Shula, having suffered through four lackluster years as an AFL expansion team (1970 was the first year with AFL teams merged into the reorganized NFL). Another new arrival, WR Paul Warfield, was obtained from Cleveland and proved beneficial to the young offense with his ability to stretch defenses. QB Bob Griese was still a work in progress, while halfbacks Jim Kiick and Eugene “Mercury” Morris, and FB Larry Csonka, were all talents on the rise. The young defense was anchored by veteran MLB Nick Buoniconti, who had rookies Mike Kolen and Doug Swift starting on either side of him, and also benefited from the presence of FS Jake Scott, a CFL veteran. After getting off to a surprising 4-1 start, however, the Dolphins had been shut out in their previous two contests and were 4-3 coming into Philadelphia. There were 58,171 fans in attendance at Franklin Field. The teams started off the game trading punts, with each blunting promising drives by committing penalties. Miami got the first break when CB Curtis Johnson recovered a fumble by FB Lee Bouggess at the Philadelphia 45. Bob Griese ran the ball himself for a 16-yard gain, but the drive stalled at the 21 and Garo Yepremian missed on a 28-yard field goal attempt. The Eagles were driving as the first quarter came to an end. Norm Snead completed consecutive passes to Harold Jackson for 15 and 9 yards and HB Cyril Pinder ran effectively. Snead capped the 80-yard, nine-play series with another pass to Jackson that was good for a 31-yard touchdown, Mark Moseley added the extra point, and the home team was ahead by 7-0. The teams again exchanged punts, with the Eagles pinning the Dolphins back at their four yard line. The visitors dug out of the hole, however. After reaching their 13, Griese threw to Paul Warfield (pictured at left) for 15 yards and Larry Csonka followed up with a 14-yard carry to the 42. But Jim Kiick lost two yards and Griese’s next pass was intercepted by FS Steve Preece, who returned it 19 yards to the Miami 37. The Eagles advanced to the 16 and Moseley booted a 23-yard field goal. 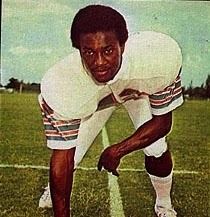 Mercury Morris returned the ensuing kickoff 51 yards to give the Dolphins good field position at the Philadelphia 49 with 1:45 remaining in the first half. Kiick ran for 12 yards and caught a pass for another seven, but Griese again was picked off, this time by LB Adrian Young. Philadelphia drove 71 yards in six plays, with Snead throwing to Bouggess for a gain of 34 yards and Pinder running up the middle for 15 yards along the way. Snead connected with Jackson once again for a 15-yard TD and, with Moseley’s conversion, the Eagles took a 17-0 lead into halftime. The teams started off the third quarter with an exchange of punts before Griese again gave up an interception, this time by CB Ray Jones, who returned it 17 yards to the Miami 16. The Eagles again took advantage of the turnover and Snead passed to Steve Zabel for a two-yard touchdown. Moseley added the PAT. Down by 24-0, John Stofa replaced Griese at quarterback for the Dolphins. Miami had to punt after a short series, but this time the visitors were the beneficiaries of an interception as Jake Scott picked off a Snead pass and returned it 47 yards to the Philadelphia 19. On the third play of the fourth quarter, Yepremian finally got the Dolphins on the board with a 24-yard field goal. The Eagles went three-and-out and punted, and the Dolphins struck quickly as Stofa threw long to Warfield for a 52-yard touchdown. Yepremian’s extra point made it a 14-point game with plenty of time remaining. Philadelphia got a 23-yard gain on a pass from Snead to WR Ben Hawkins on the next series, but once again had to punt, and both teams followed up with short possessions leading to punts. Finally, starting at their own 38 with 5:16 to go, the Dolphins put together a six-play, 62-yard drive. Stofa converted a third down with a pass to Kiick that gained 20 yards and finished off the series with a toss to WR Willie Richardson for a 27-yard TD. Yepremian again converted and Philadelphia’s margin was down to seven points. That was the last gasp for Miami, however. Following a short series that led to a punt by the Eagles, the Dolphins got the ball back at their 20 with the clock showing 1:40 to play. Stofa completed a pass to Morris for 14 yards but then was intercepted by Young, whose second pickoff of the day sealed the 24-17 win for the Eagles. Philadelphia had the edge in total yards (291 to 245) and first downs (17 to 14). The inspired Eagles defense accounted for four sacks and four interceptions, which accounted for Miami’s turnover total. Philadelphia turned the ball over twice and gave up just one sack. The Dolphins also were penalized eight times, at a cost of 62 yards, while the Eagles were flagged on six occasions. 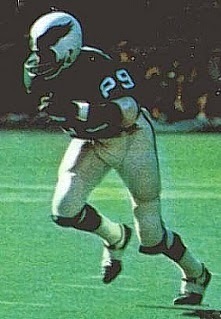 Norm Snead (pictured above) completed 15 of 29 passes for 187 yards and three touchdowns while giving up one interception. Harold Jackson had 5 catches for 74 yards, two of them for TDs. Lee Bouggess also had 5 receptions, for 57 yards, although he gained only two rushing yards on 12 carries. Cyril Pinder ran for 99 yards on 23 attempts. Defensively, Adrian Young accounted for two of Philadelphia’s four interceptions. For the Dolphins, Bob Griese was successful on just 6 of 14 throws for 42 yards with no TDs and three interceptions. In relief, John Stofa went five-of-15 for 120 yards, two of them good for touchdowns and with one picked off. Willie Richardson caught three passes for 39 yards and a TD and Paul Warfield gained 67 yards on his two receptions that included one for a long score. The Eagles tied Atlanta the next week and then upset the Giants on the way to a 3-10-1 record that placed last in the NFC East. The season turned around in a good way for Miami, which won its remaining six games to end up second in the AFC East at 10-4. The Dolphins qualified for a Wild Card playoff spot in the revamped postseason format brought about by the AFL/NFL merger and lost in the Divisional round to Oakland. Norm Snead, in his last year with the Eagles, passed for 2323 yards and 15 touchdowns, but with 20 interceptions. Harold Jackson caught 41 passes for 613 yards (15.0 avg.) and five TDs. The performance by the rookie Lee Bouggess was characteristic as he led the club with 50 pass receptions, for 401 yards (8.0 avg.) and two TDs, but averaged just 2.5 yards per rushing attempt with 401 yards on 159 carries. Just as Miami’s fortunes improved, so did Bob Griese’s. The fourth-year quarterback completed 58.0 percent of his passes for 2019 yards and 12 touchdowns, although with 17 interceptions, and was named to the Pro Bowl. Paul Warfield missed three games due to injury but averaged 25.1 yards on 28 catches for 703 yards and six TDs.